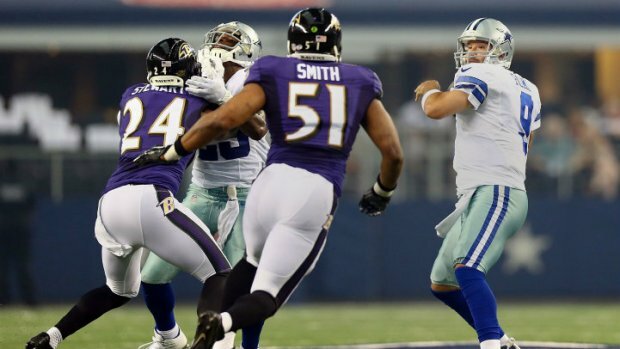 In what would have been a nail biter if the game had counted, the Ravens emmerge victorious, 37-30 over the Dallas Cowboys, in their second preseason action of 2014. Here’s who helped themselves, and who needs improvement as we are two games away from final cuts. Jeromy Miles and Anthoy Levine made the key blocks on Deonte Thompsons 108 yard KO return for a TD. Thompson had a couple nice returns on the night. Kyle Juszczyk was also in on the blocking on that return. It’s clear he is going to have an increased role in the offense, often being used in motion and split out in many different positions. He caught two balls for nine yards. Chykie Brown is in a fight for the CB3 spot, and made a nice play on defense to break up a pass that would have been six if caught. His man got behind him, but Brown snuck the hands in the arms of the receiver as the ball arrived to knock it to the turf. C.J. Mosley proved his nice debut last week wasn’t a fluke. Showed great open field tackling, ability to cover the entire field sideline to sideline, and his best play was eluding a blocker on a screen pass to tackle the receiver before he could get anything going. Rick Wagner is the man Ray Rice ran behind on a counter play for a 18 yard gain on the first play of the Ravens second drive. Pernell McPhee picked up a sack in the second quarter. Brynden Trawick playing center field, picked off a Brandon Weeden pass that he put too much air under. The INT led to a seven play, 96 yard drive for the Raven offense, finished off by a TD pass to Torrey Smith. The offensive line across the board in run blocking: They didn’t play a perfect game as Flacco, Taylor, and Wenning were was pressured a bit, but they did pave the way for 151 rushing yards on 31 carries (4.9 YPC), including a 30 yard tote by Bernard Pierce. We’ll be ecstatic to see that kind of production compared to last year. The second teamers blew up the defensive front on a goal line carry by Lorenzo Taliaferro. Darian Stewart made a free run at the QB on a safety blitz that nearly led to another Dallas turnover. The defense shut down the Cowboys two minute drill attempt with a three and out and 12 seconds ran off the clock. Tyrod Taylor had another nice game, going 6-8 for 59 yards. He rushed twice for six yards. Daryl Smith’s tackling. He is the worst starting LB in run defense, and twice on one series he failed to make an open field tackle. Once on Dez Bryant who Smith was lucky the refs blew the play dead when he wasn’t in fact down. Another miss was on DeMarco Murray near the sideline which allowed him to gain a few extra yards. He did later record a tackle for loss, albeit against the Dallas second teamers. Dominique Franks ran with the first team and looked awful on a deep ball to Dez Bryant. Franks was turned around, and by the time he found the ball he was falling to the turf. It was an easy uncontested haul in for a Bryant TD. Franks was later flagged for holding on a 19 yard punt return by Michael Campanaro. Steve Smith. Give the Dallas defense some credit, but on every contested ball thrown to him, he didn’t out muscle his guy to make the catch. I’m not however worried at all about the proven veterans ability. Pass blocking: Eugene Monroe and Kelechi Osemele got beat a couple times. For more on that, check out this breakdown from our Ravens analyst, Nadeem Kureishy. Trawaick is also in our stock up, but he hurt himself in the eyes of the coaches twice after the INT. Later in the game he dropped an easy pick opportunity, then a missed, lazy attempt to break up a pass, Dallas scored a TD. A solid hit would have jarred the pass loose, or stopped the receiver short of the goal line. Fumbles: Justin Forsett had his second fumble of the preseason, and Taliaferro coughed one up as well. John Simon is one of those fringe guys who is entering his second season. He has been a non-factor in two games so far and is playing with third teamers. Terrance Brooks is also playing with third teamers, and did not impress in his second look. It looks like Darian Stewart has a firm hold on the starting FS job. Keith Wenning held onto the ball too long on his first pass attempt of the preseason, getting sacked and fumbling the ball on the blind side hit. He was sacked again on his second attempt. On his third attempt his pass floated on him and was nearly picked off. With another decent performance by Tyrod Taylor, Wenning’s stock is falling fast. Omar Brown was trucked over by a third team RB. That will certainly come up in kangaroo court when the team reviews the game tape. Later Brown committed a completely unnecessary helmet to helmet hit on a receiver with the ball not even in catchable range. It extended the drive and allowed Dallas to close the gap and stay in the game. The first team will get their most extended look next week in their third preseason game where they will host the Washington Redskins.